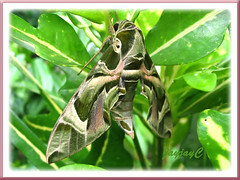 To be able to see such a captivating hawk-moth in person is just too marvelous for words. And, to see its transformation from a shriveled leaf into such a strikingly beautiful moth within less than a minute is another wonderful experience altogether. Like magic actually! Reminds me of The Frog Prince fairy tale where the frog changed to a prince! Walking leisurely in our tropical garden last Sunday morning, I noticed a dried and shriveled brown leaf amongst the bright and colorful foliage of our Arrowhead Croton bush. As it looked unsightly, I moved forward to remove it but the second I did that it wriggled and became alive! Eeek…instinctively, I released it and ran inside to grab my camera. I had imagined it to be a hummingbird moth, having experienced such an incident before but had missed the opportunity to capture a shot then, as it took flight immediately. (Just visualize the insect in the above image to be colored brown and you’ll understand why I was deceived into seeing it as a shriveled leaf – anyway, I am positive it was brown initially). When I returned in a jiffy, I was astounded by what I saw – it had changed dramatically into the most beautiful and colorful hawk-moth I have ever seen! 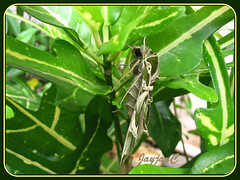 So perfectly camouflaged with colors that blend well in the surrounding foliage. Wow, what a stunning beauty! Surprisingly, it hung suspended beneath some leaves, sheltered from the sun and at the same spot all day long. It was not deterred at all by my presence or the camera that was held just a couple of inches away as I delightfully took numerous shots. It stayed put for hours, wary neither of the shuffling of leaves nor the frequent spot-check by us throughout the day. It was still rested at the very same spot when I had my final peep after completing our gardening chores by dusk! Though pleased, I was a little dumbfounded that it did not take flight earlier. 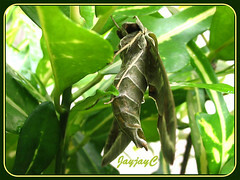 Could it have been a newly emerged hawk-moth, too immature or innocent to know fear? Nonetheless, by the next morning, it was gone! 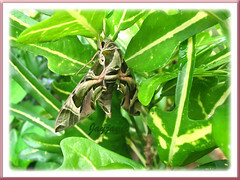 Daphnis nerii or Oleander Hawk-moth is a member of the Sphingidae family, whose members are commonly known as the hummingbird, sphinx or hawk moths. This beautiful and attractive species has a wingspan of 8-12 cm. Its forewings are intricately patterned in gorgeous shades of olive green and marked with small blotches of pink and white, including a pale white apical band on each forewing. 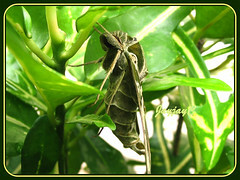 The hindwings, on the other hand, are greyish green, with a pale white wavy line. Body is mostly olive green too, with white markings and measures about 5 cm from head to tail. It rest by day with its abdomen protruding upwards and flies mostly just after dusk or before dawn. Adults feed on flowers such as Petunia, Lonicera, Nicotiana, Saponaria and others. World Distribution: South Europe, in the tropics and subtropics of Africa and Asia. North Africa eastwards into Asia. Habitat: Dry river-beds, oasis, warm hillsides and mostly seen wherever its food plant, the Oleander is. Food plants: Caterpillar feeds mainly on the flowers and young leaves of Nerium Oleander. (Do read Eddy’s comment dated Feb 13, 2009 below to know how devouring they can be!). Other minor foodplants include Periwinkle (Vinca spp. ), Grape Vine (Vitis vinifera), Ipomoea, Gardenia, Adenium multiflorum and others. External link: Check for more information on Daphnis nerii at Tony Pittaway’s site and his species list on Sphingadae of the Western Palaearctic. But lucky they dont like my Periwinkle (Vinca) and Grape. How depressing for you. I didn’t know that its caterpillars can devour a whole shrub in such a short period. Nonetheless, the adult moth is so beautiful. Seems to be a beauty and a beast too, just like its host plant, the Oleander! 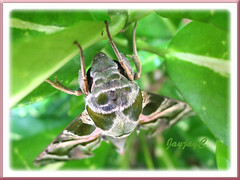 Spotted an oleander hawk moth at a home depot store in Houston, TX 4/24/10. It was the most beautiful thing that I had ever seen. It was resting on a stack of landscaping stones. Had my son check the internet to see what it was and he said that it was native to Africa and Europe. Sure was a far way from home. Had never seen one in the US before. Hi Joyce! Must have been an exciting experience for you too, yes? It hadn’t visited our garden since that first appearance. I just love to see butterflies, moths and other insects in our garden and capture shots of them to share here! 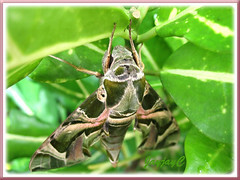 We have one of these oleander hawk moths hanging around on a hydrangea plant in our front yard….the thing is, we live in Southern Illinois, U.S. From the research I have been doing, this moth should not be here. Am I right? I photographed what I believe to be an Oleander Hawk Moth on an overhung, west exposure, exterior brick wall at our home in Dallas on 9/28/2010. The photo was taken just as the sun was starting down, so the pinkish tint is not as visible. Our neighbors next door have a number of unusual plants, including quite a few which attract butterflies and hummingbirds. A correction to my earlier posting! According to Texas Parks & Wildlife what I photographed was not an Oleander Hawk Moth, but rather a Pandorus Sphinx Moth. They are strikingly similar in appearance. Tonight, in our fire station, we noticed a large moth on the back of the fire engine. After taking a picture and doing some research, it appears that we have seen an Oleander Hawk Moth in Philadelphia, Pennsylvania. Hi there, saw one of these in Crete last week, wondered what it was until I saw this web site.It was ‘resting’ on a concrete path near to bushes next to our holiday apartment door ,during the late evening.It seemed heedless to possible dangers and was easily visible against the grey coloured concrete.I moved it in to the bush area and saw that it remained in that position for about two days, shifting position slightly and then disappearing..
We have just found this wonderful moth at our front door and had to find out what kind it was. My son is amazed and have taken some lovely shots of it in Dubai. Gorgeous colouring. Lying motionless so hope he finds his wings soon and flies away.